While CEDIA is full of established brands occupying giant booths, it is also a show where you’ll find startups that target specific needs with dedication. The drive to succeed fuels competition, and Next Level Acoustics showed up at CEDIA ready to rumble. The company, started by AVS Forum Blu-ray reviewer Lee Weber, was exhibiting at CEDIA for the first time, and I liked what it was up to. At CEDIA 2017, custom soundbars were definitely a thing. No longer restricted to the high-end custom shops such as James Loudspeakers, numerous companies let you order a (passive) soundbar at a custom length and in a custom finish. To that end, Next Level Acoustics was showing its Fusion Reference soundbar, which is available either flat, or curved depending on your TV type. Lee was at the Next Level Acoustics booth and both queued up the demos plus discussed the products. As I listened to “24K Magic” by Tony Modicano, I duly noted the soundbar had much more in common with real speakers—in terms of capability—than what you usually call a “soundbar.” And when Lee mentioned he has built a custom unit for a 120″ screen, I understood exactly what the Fusion Reference is all about: Actually hiding a traditional speaker system in a soundbar form factor. In other words, these ARE real speakers. You want specs? You got ’em. The Fusion Reference is a sealed 3-way design. It relies on three silk-dome tweeters plus six 5.5″ woven-fiber mid/woofers for a frequency response of 44 Hz to 20 kHz. Rated sensitivity is 92 dB/W/m and this is a 4-ohm (nominal) device that’s rated to take up to 350 watts of power. As you might imagine, if you power a Fusion Reference with a good AVR and add a competent sub, you’re going to be rocking the house in no time at all. Of course, being a CI product you have to call for an estimate to get a price, but one of Next Level Acoustics’ goals is to provide superior performance for the dollar. 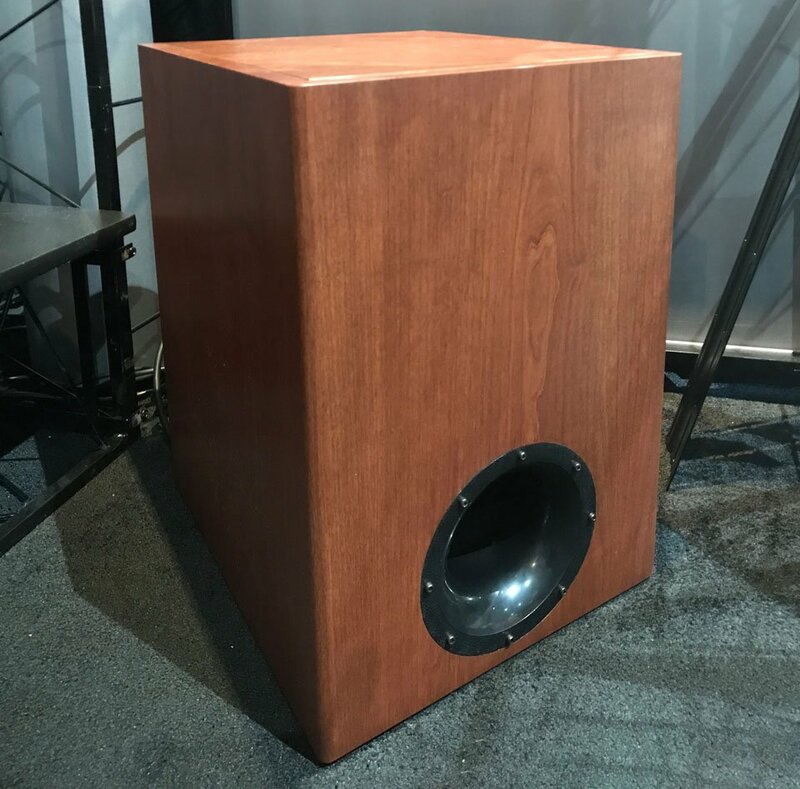 Lee also demonstrated Next Level Acoustics’ “High Velocity Subwoofer” in a 10″ version, the CI-HV10. It’s vented bandpass design offered powerful, deep response that moved some serious air for a sub its size. I checked out the Disc Wars scene from Tron Legacy and was satisfied that it performs at a high level. The 10″ model subwoofer Lee demoed weighs 69 pounds and measures 17″ D x 14″ W x 20″ H. It’s powered by a 500-watt (RMS) amplifier and the 10″ driver has a 3″ voice coil! That’s good for a frequency response of 24 Hz to 100 Hz. Meanwhile, the step-up 12″ model has the same amount of power, but is larger and heavier with more efficient driver and a larger vent, so it can dig deeper with a response of 19 Hz to 100 Hz. Lee noted that he can manufacture custom variants of the High Velocity Subwoofer using a 15″, 18″, or even a 21″ driver. Next Level Acoustics touts gains in efficiency as well as output as the reason for going with a bandpass sub that uses an internal chamber, as opposed to an open-face vented or sealed subwoofer design. The proof is in the performance and I thought the 10″ model sounded (and felt) great. As far as CEDIA debuts go, Next Level Acoustics has done well. The demos hinted at performance that would surely take a better environment to fully appreciate, and the 2-week turnaround cited by Lee is in line with what competitors are doing. I wish Lee the best of luck with his enterprise and hope to see bigger booths and more products in years to come.